What is GT MASTER WHAT IS GT MASTER? 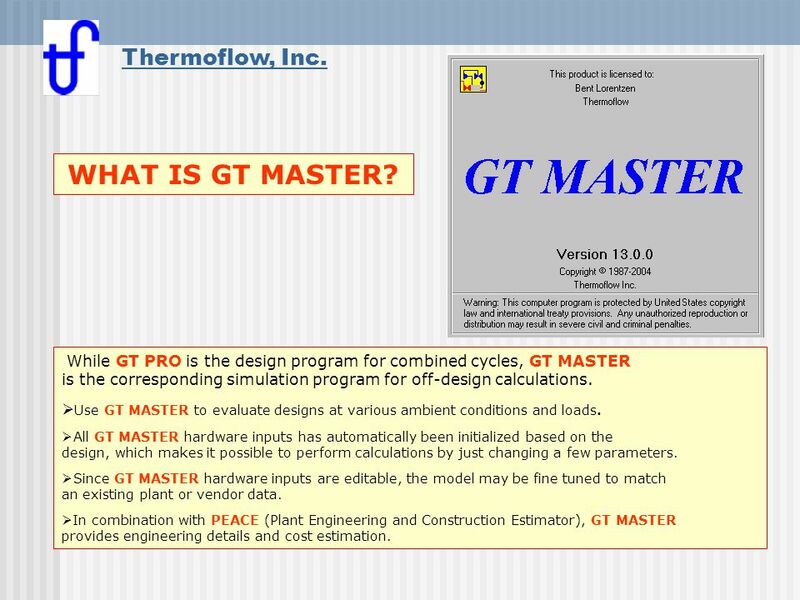 Thermoflow, Inc.
1 What is GT MASTER WHAT IS GT MASTER? 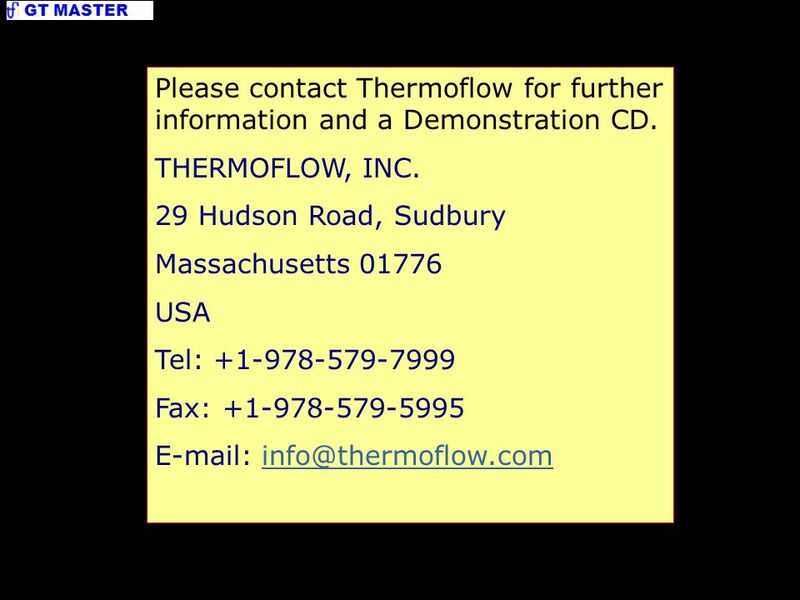 Thermoflow, Inc. 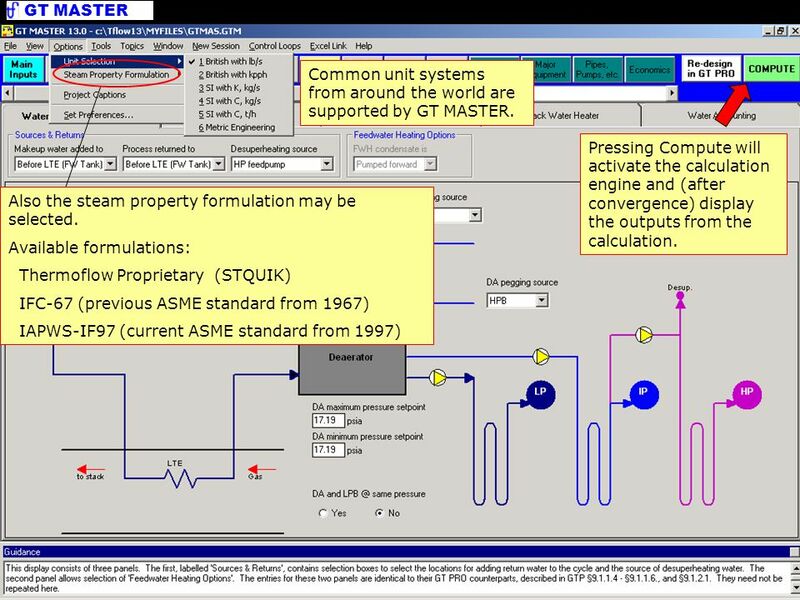 While GT PRO is the design program for combined cycles, GT MASTER is the corresponding simulation program for off-design calculations. Use GT MASTER to evaluate designs at various ambient conditions and loads. All GT MASTER hardware inputs has automatically been initialized based on the design, which makes it possible to perform calculations by just changing a few parameters. 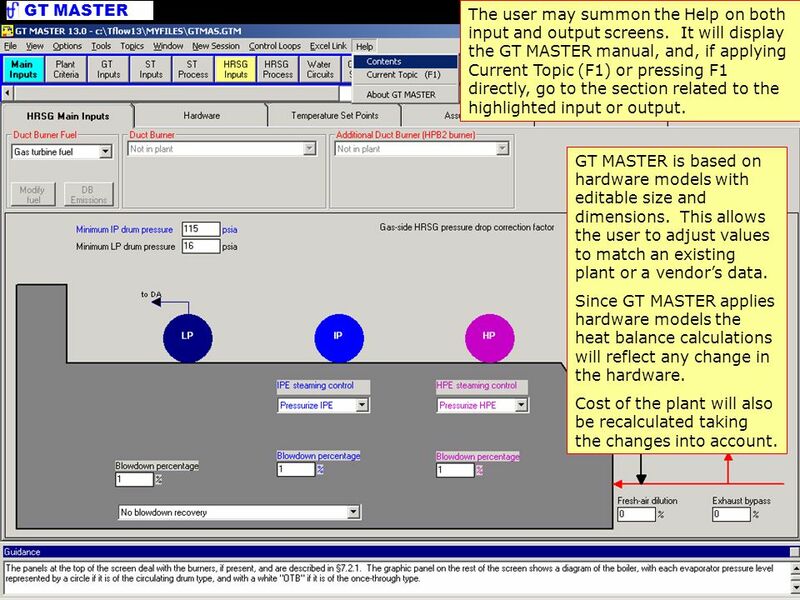 Since GT MASTER hardware inputs are editable, the model may be fine tuned to match an existing plant or vendor data. In combination with PEACE (Plant Engineering and Construction Estimator), GT MASTER provides engineering details and cost estimation. 2 Open Files Load existing GT MASTER file or import GT PRO file. 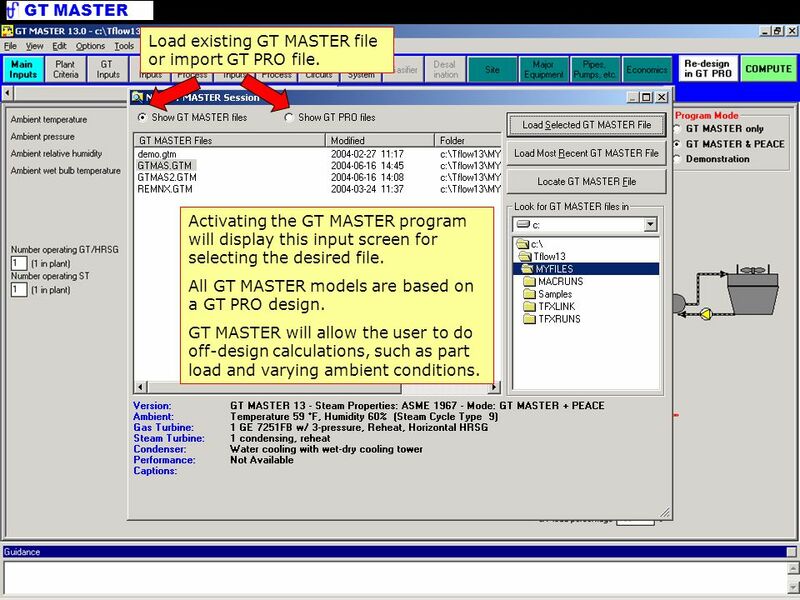 Activating the GT MASTER program will display this input screen for selecting the desired file. All GT MASTER models are based on a GT PRO design. GT MASTER will allow the user to do off-design calculations, such as part load and varying ambient conditions. 3 At any time during the session the user can press compute to activate the calculation. Input Topics All the main topics are arranged horizontally to underline the fact that, contrary to design in GT PRO, off-design in GT Master has no natural order of editing the topics. “Green” topics are available for PEACE licenses only, and their inputs primarily impacts the cost calculations. The user may go back to GT PRO to redesign the plant if necessary. The input screens apply graphical displays to ease the use of the program. Every entry box has been filled with a values from the design model. The user never has to fill an empty box. Instead the user edits just those that are of concern to him. Editing Inputs Confirm actual ambient conditions. 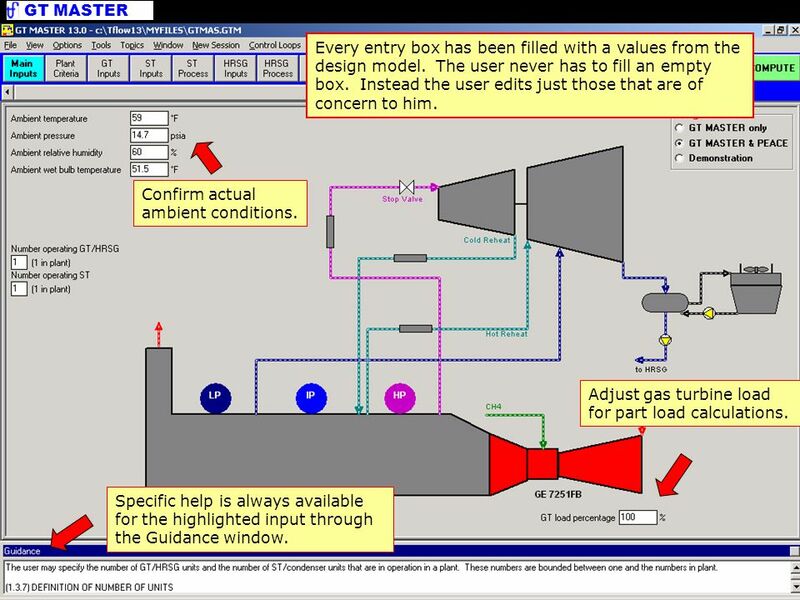 Adjust gas turbine load for part load calculations. Specific help is always available for the highlighted input through the Guidance window. 5 Each main topic holds a set of input tabs for sub topics related to the main topic. E.g. highlighted main topic is ST Inputs. 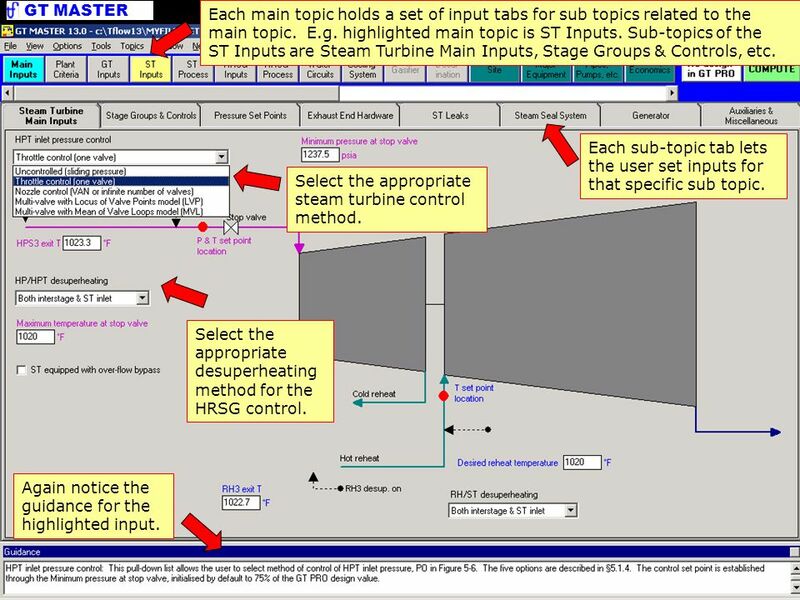 Sub-topics of the ST Inputs are Steam Turbine Main Inputs, Stage Groups & Controls, etc. Detailed Inputs Each sub-topic tab lets the user set inputs for that specific sub topic. Select the appropriate steam turbine control method. 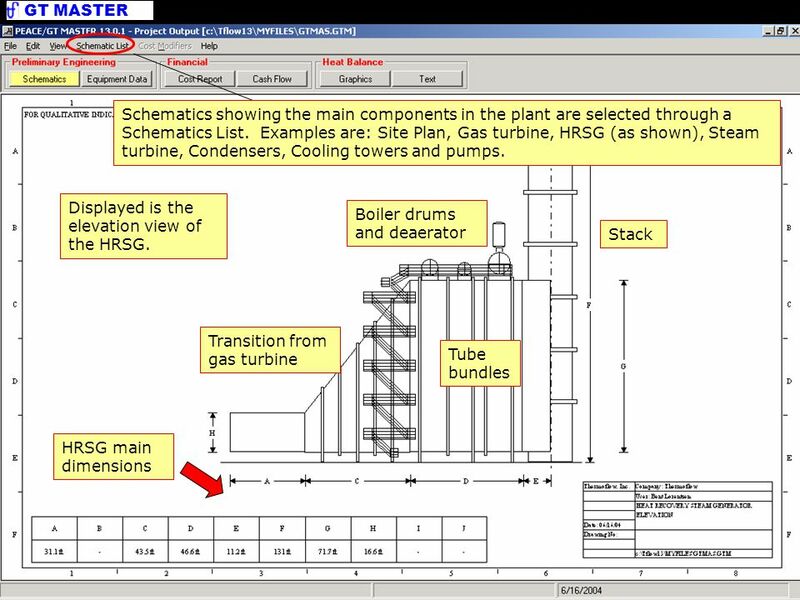 Select the appropriate desuperheating method for the HRSG control. Again notice the guidance for the highlighted input. The user may summon the Help on both input and output screens. It will display the GT MASTER manual, and, if applying Current Topic (F1) or pressing F1 directly, go to the section related to the highlighted input or output. Hardware Models GT MASTER is based on hardware models with editable size and dimensions. 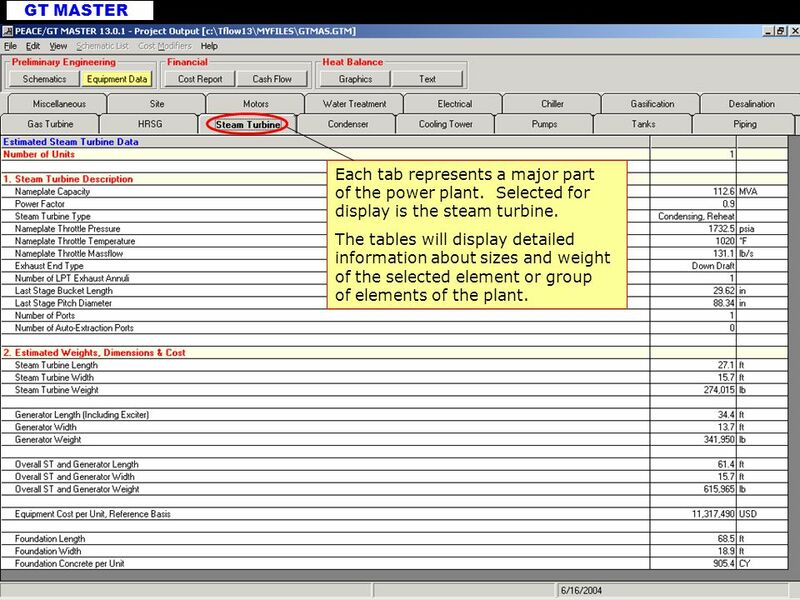 This allows the user to adjust values to match an existing plant or a vendor’s data. Since GT MASTER applies hardware models the heat balance calculations will reflect any change in the hardware. Cost of the plant will also be recalculated taking the changes into account. 7 Hardware Details Even details of tube bundle design such as fin-tube type, materials, tube length, bundle width, number of rows, tube diameter and fin dimensions may be edited. This flexibility allows the user to match known plant data. 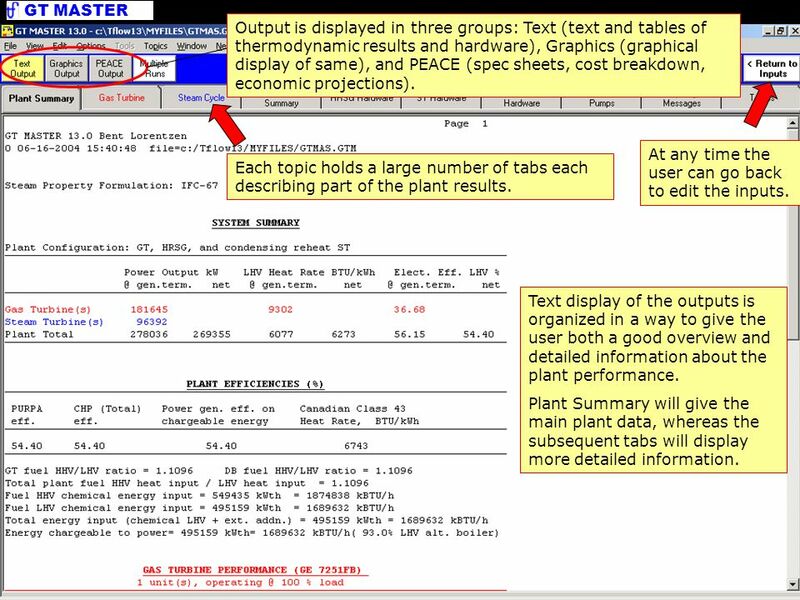 9 Output is displayed in three groups: Text (text and tables of thermodynamic results and hardware), Graphics (graphical display of same), and PEACE (spec sheets, cost breakdown, economic projections). Output Topics At any time the user can go back to edit the inputs. Each topic holds a large number of tabs each describing part of the plant results. 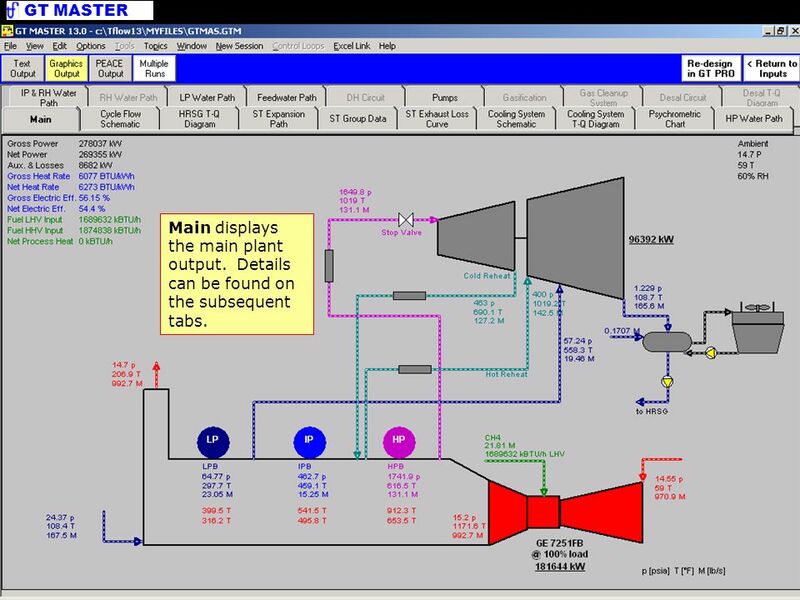 Text display of the outputs is organized in a way to give the user both a good overview and detailed information about the plant performance. Plant Summary will give the main plant data, whereas the subsequent tabs will display more detailed information. 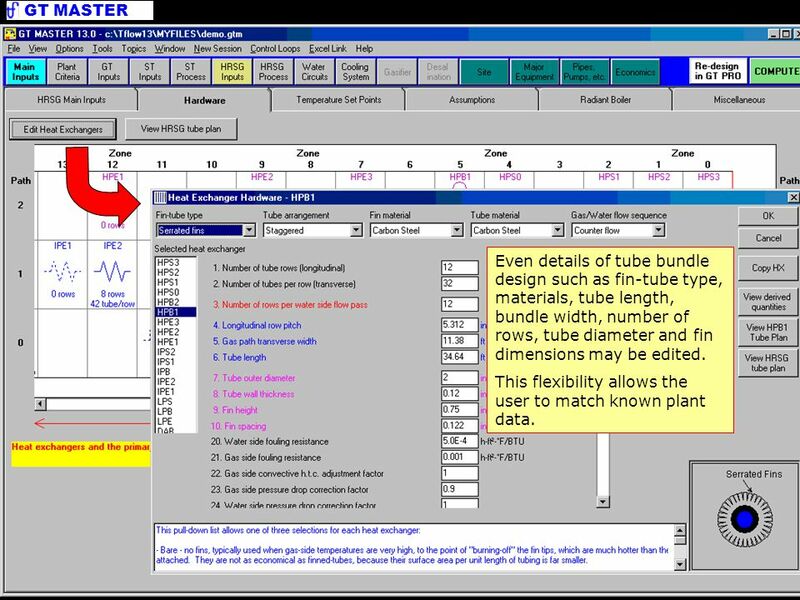 10 Multiple runs may be performed applying the Thermoflow Macro for studies of parameter variations. 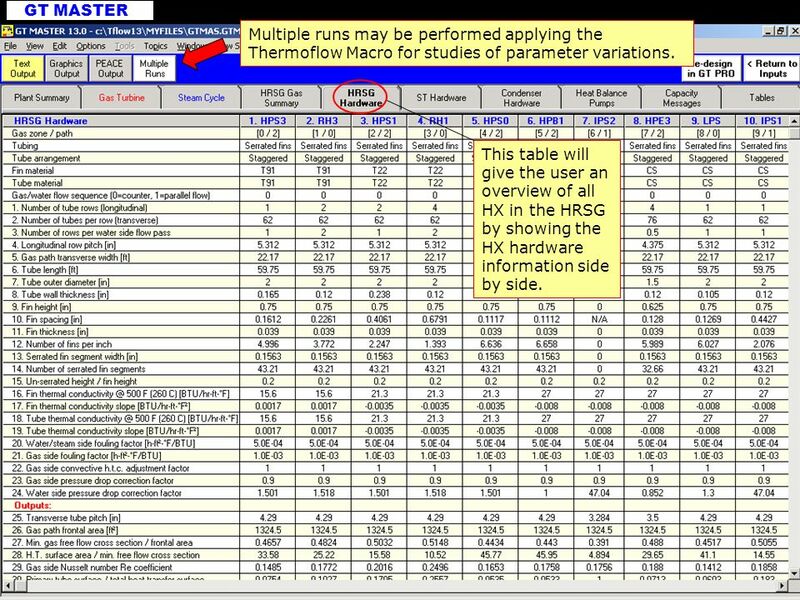 Text Output This table will give the user an overview of all HX in the HRSG by showing the HX hardware information side by side. 11 Graphics Output - Main Main displays the main plant output. Details can be found on the subsequent tabs. 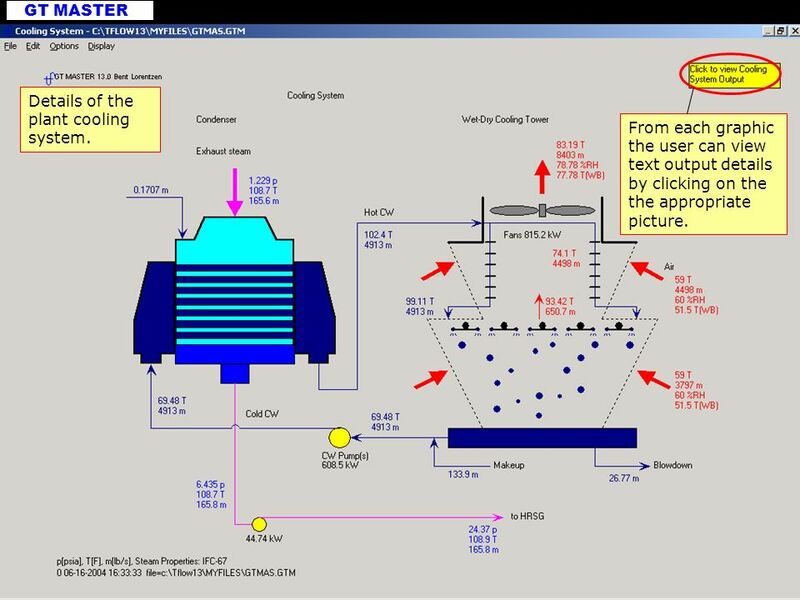 Details of the plant cooling system. From each graphic the user can view text output details by clicking on the the appropriate picture. Each tab represents a major part of the power plant. Selected for display is the steam turbine. The tables will display detailed information about sizes and weight of the selected element or group of elements of the plant. Cash Flow will tell the user how the economy throughout the lifetime of the plant will be. PEACE Output – Cost Report Each tab represents a part of the total cost of the power plant. Selected for display is the Specialized Equipment. The tables will display detailed information about equipment and labor cost. 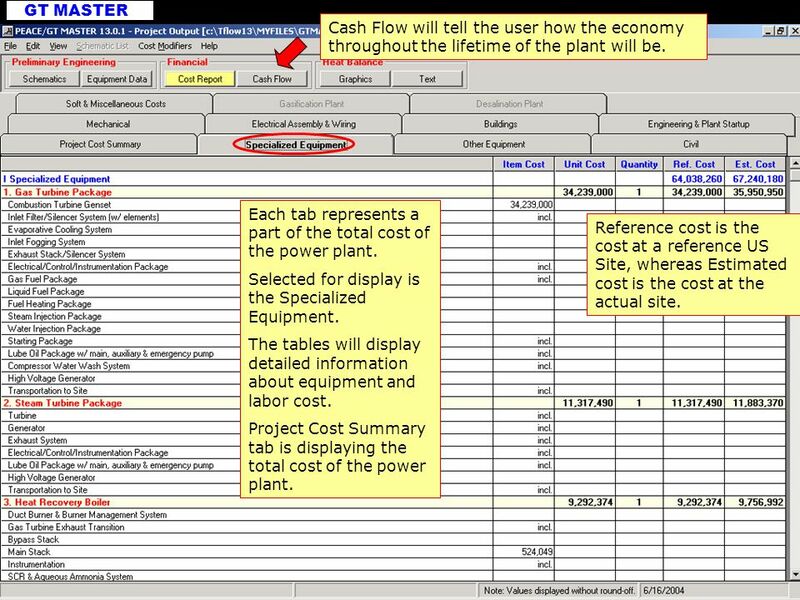 Project Cost Summary tab is displaying the total cost of the power plant. Reference cost is the cost at a reference US Site, whereas Estimated cost is the cost at the actual site. 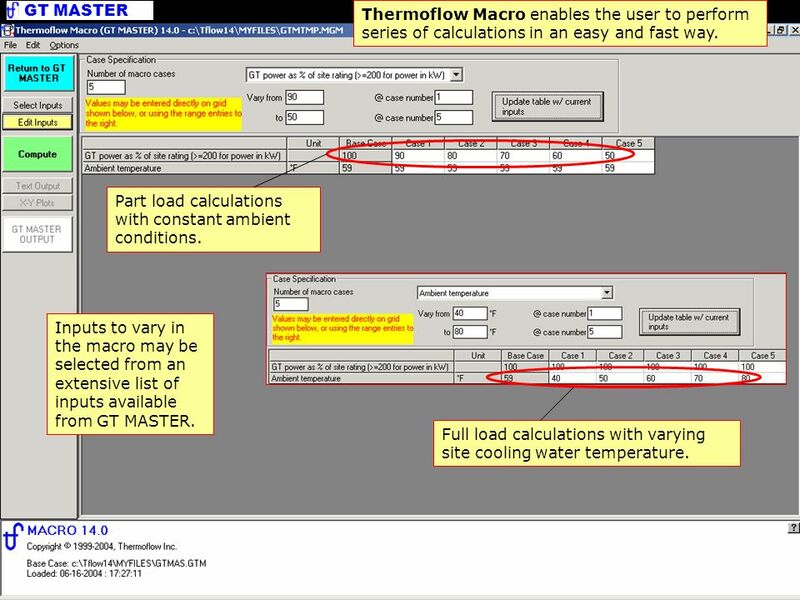 Thermoflow Macro enables the user to perform series of calculations in an easy and fast way. Multiple Runs – Edit Input Part load calculations with constant ambient conditions. Inputs to vary in the macro may be selected from an extensive list of inputs available from GT MASTER. Full load calculations with varying site cooling water temperature. 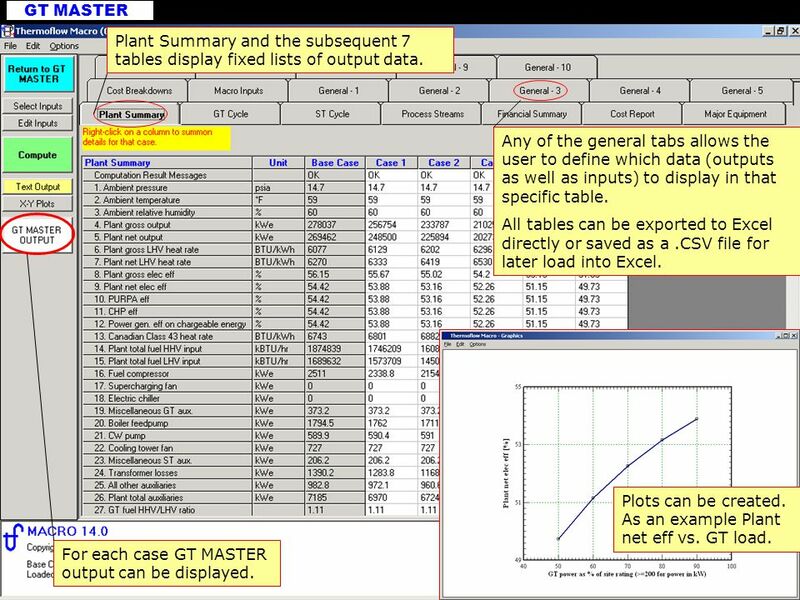 17 Plant Summary and the subsequent 7 tables display fixed lists of output data. Multiple Runs - Output Any of the general tabs allows the user to define which data (outputs as well as inputs) to display in that specific table. All tables can be exported to Excel directly or saved as a .CSV file for later load into Excel. Plots can be created. As an example Plant net eff vs. GT load. For each case GT MASTER output can be displayed. Download ppt "What is GT MASTER WHAT IS GT MASTER? Thermoflow, Inc."
3/17 Dividend Street, Mansfield, 4122, Queensland, Australia phone: web: The SuperCycler A Software. WHAT IS DRS? Thermoflow, Inc.
12-CRS-0106 REVISED 8 FEB 2013 PRESENTS vTools Voting: Getting Voter List. WHAT IS STEAM PRO? Thermoflow, Inc.
What is STEAM MASTER WHAT IS STEAM MASTER? Thermoflow, Inc.
WHAT IS ELINK? Thermoflow, Inc.
WHAT IS THERMOFLEX? 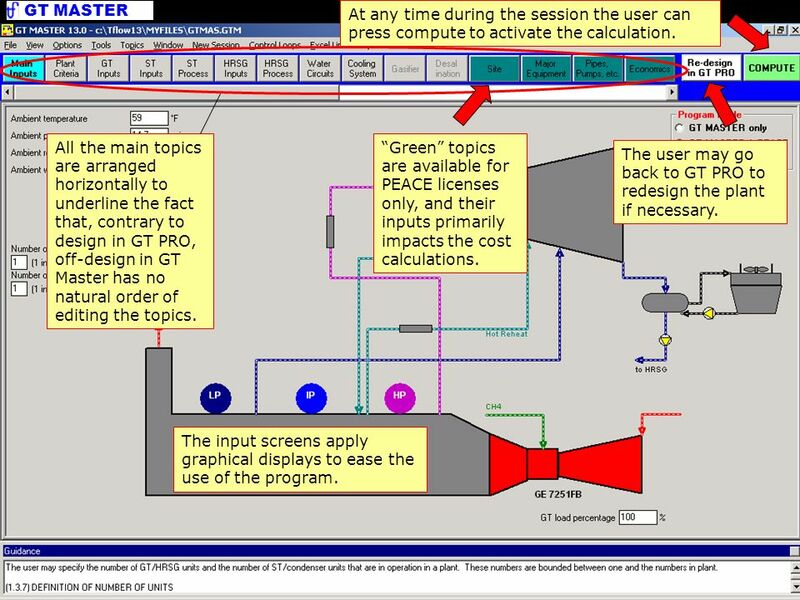 Thermoflow Inc.
What is GT MASTER While GT PRO is the design program for combined cycles, GT MASTER is the corresponding simulation program for off-design calculations. Welcome to a tour of Limb Volumes Professional 6.0 LVP6.0 is the latest version of the world famous and widely used lymphedema tracking and reporting software. WHAT IS GT PRO? Thermoflow Inc.
A Proposed Model for GV Express October 2008 GREEN version. CTS130 Spreadsheet Lesson 20 Data Consolidation. Consolidation is a process in which data from multiple worksheets or workbooks is combined and summarized. With Microsoft ® Excel e © 2013 Pearson Education, Inc. Publishing as Prentice Hall1 Excel 2010 Chapter 9 Creating a Worksheet and Charting Data. Thermoflow, Inc. TOPS stands for Thermoflow’s Optimization System and is a general purpose optimizer for use with Thermoflow’s core programs. TOPS runs. MEPO Training MEPO Database Access Training Presentation Copyright 2011 Rodger B. Fluke, MPA. What is STEAM MASTER While STEAM PRO is the design program for conventional steam cycle plants, STEAM MASTER is the associated simulation program for off-design. This tutorial is a PowerPoint ® file which includes recorded narration. Automatic slide sequencing is coupled to the sound track. For the most effective.